This was a productive week at Westfarthing Woodworks, and in case you missed them, here are the posts for the week, and what you can learn from each of them. Happy building, and leave a comment if you have any questions. 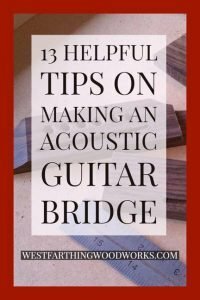 13 Helpful Tips on Making an Acoustic Guitar Bridge is your guide to making an excellent looking bridge. The tips are all really helpful, and they will give you the confidence that you need to start making your own bridges. The guitar bridge is easier than it looks. I’m going to show you that you don’t need to worry about anything. The process that I use is very good, and it’s designed to keep you from having your heart broken. The main idea is to do the hardest parts first. This way, you have much less risk near the end. If you do the hard parts first, and make a mistake, you might only be into the project a few minutes before you have to start over. If you do the hard parts last, you might be sent back to the starting line after a couple hours of work. That’s not fun at all. My process fixes that, so enjoy. 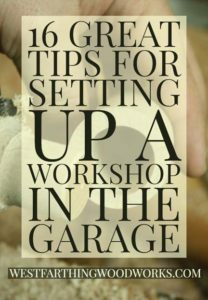 16 Great Tips for Setting Up a Workshop in the Garage is your guide to setting up a shop you can be proud of. It’s packed full of great tips, layout tricks, and storage hacks that will make your garage the Swiss Army Knife of shops once you are all done. Most woodworkers end up in the garage as their first shop, and for a lot of good reasons. First, it’s a really wide open space. Second, it’s usually not that difficult to clear out and claim the space. Most people have garages, and for the super low burden of parking outside, you can have a shop. There are a few other things you need to do in order to have a shop that runs well. This is where my guide comes in, and it will help you solve all your problems before you make your first cut. 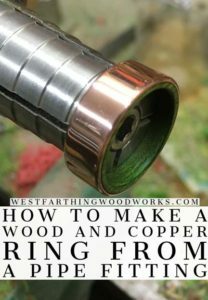 How to Make a Wood and Copper Ring from a Pipe Fitting is a step by step tutorial for making a wood and metal ring from a simple pipe fitting. This tutorial is very detailed, well photographed, and thoroughly explained. Even if you are new to making wooden rings, you can follow along and make something you will be proud to show everyone. The tutorial works the best on the lathe, but you can buy a ring mandrel and make the project using a hand drill in a pinch. It’s easier on the lathe, but mandrel does give you the ability to make rings using power from a simple hand drill. That’s great for beginners, and inexpensive too. When you are done, you will have a ring with a copper band on the outside, and wood on the inside. You can use any material you like for the wood or the metal, the process is the same. If you have any questions on Westfarthing Woodworks Post Review for 11/18/2018, please leave a comment and I will be glad to answer them. Happy building.